The 1940s are indisputably one of the golden decades for watch design. Benefitting from being preceded by both the hugely influential Bauhaus design school and the Art Deco eras; watches from the 1940s developed an identity of their own, becoming recognisable for their simplicity, style and class. This decade in particular is known for its outstandingly beautiful chronographs, which are highly sought after by many collectors (with increasingly deep pockets). Quite remarkable really, that so many fine watches were conceived in the 1940s; for half of that period Europe was embroiled in the resource-draining effects of World War II, where both materials and of course labour were under stress. 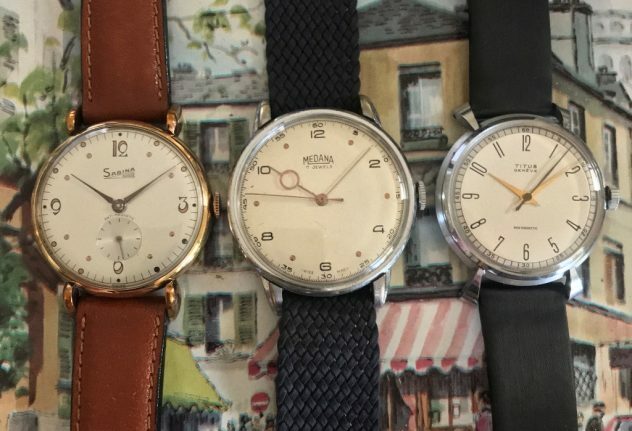 Although the fact that neutral Switzerland avoided widespread bombing (unlike Germany and France), probably helped its watchmaking industry weather the storm better than most. Big names such as IWC, Longines, Rolex and Breitling, amongst many others, designed and produced some of their most iconic models during the 1940s; many of which either continue today or have been reissued. Entering the market for vintage watches from this era need not be focussed solely on the superb but increasingly expensive chronographs; and indeed beautiful designs were not exclusive to the larger brands – as proven by the more affordable time-only examples we have here from three relatively obscure Swiss brands: Titus, Sabina and Medana. Titus (aka Solvil et Titus) was a brand name established by the brilliant Paul Ditisheim in 1887 in La Chaux-de-Fonds. Ditisheim’s other main brand was Vulcain, a superb manufacturer responsible for the first commercially available mechanical alarm wristwatch, and still operating out of a charming chalet in Le Locle. This particular Titus, however, was made after Ditisheim handed over Titus to Paul Bernard Vogel, who took the brand’s headquarters to Geneve and greatly expanded the company operations. 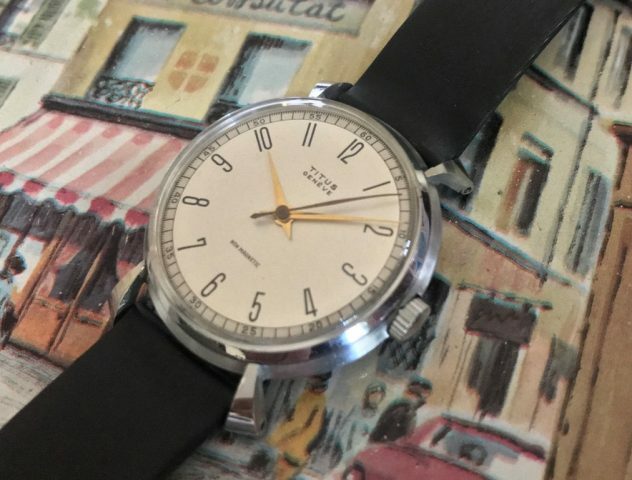 The two tone dial of this Titus is a classic Bauhaus-influenced design, housed in a beautiful all-stainless steel stepped case, with a fine ‘whip’ sweeping centre seconds hand, and of course those striking spider lugs. An exercise in clarity and distinction. The Sabina on the other hand, exhibits a bit more flair yet no less classic ‘40s design cues. Beautiful tear drop lugs, lance hour and minute hands, and a classically avant-garde numeric font. Sabina began in 1919 in Tramelan-Dessus, one of many brands established by Paul-Vigile Mathez SA. Finishing up the old timer trio is an oversized Medana, with its wonderfully prominent ‘pontife’ hour hand, strikingly modernist numerals and Art Deco-style scalloped lugs. The Medana is powered by an in-house Meda 7 jewel manual wind lever movement. 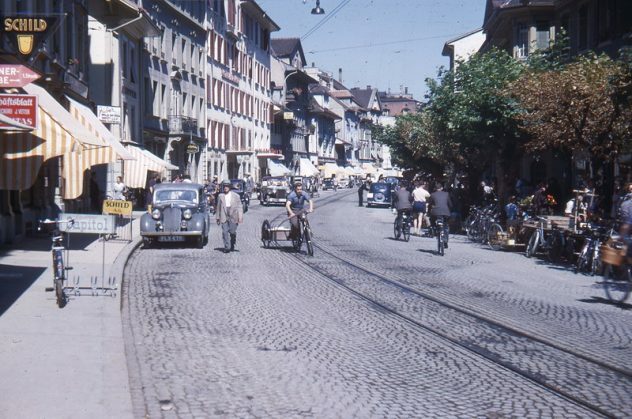 Medana can trace their origins back to 1888, but were established as a brand of Meyer & Stüdeli SA in Solothurn, in 1900. 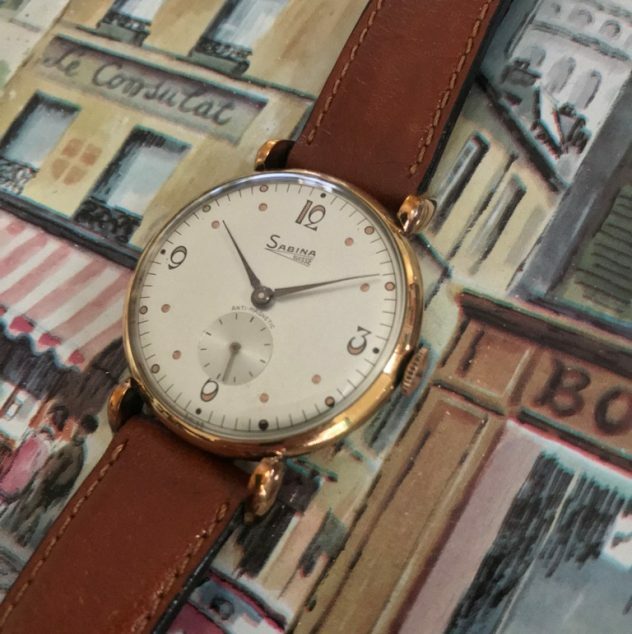 Nearly 80 years on, the 1940s continue to be a valuable source of inspiration for vintage-inspired watch designs today, and I truly hope that in 20 years time the interest in this period from watch enthusiasts will not have waned. I have a “meyer & studeli s.a.” Watch. It does not say a name on the dial. It says “meyer & studeli s.a. On the movement and “meyer & studeli s.a. wear ever rolled gold” on the inside of the case back. The watch winds up and works great. But I cant find the watch or anything similar to it on the internet. I would like to know more about it, if anyone can help me or would like to purchase let me know. Thegreatunounoe@gmail.com. Thanks. FYI : In 1905 Fritz Meyer entered into a partnership with the watchmaker Johann Studeli forming the firm Meyer and Studeli. They created the brand Roamer in 1908. 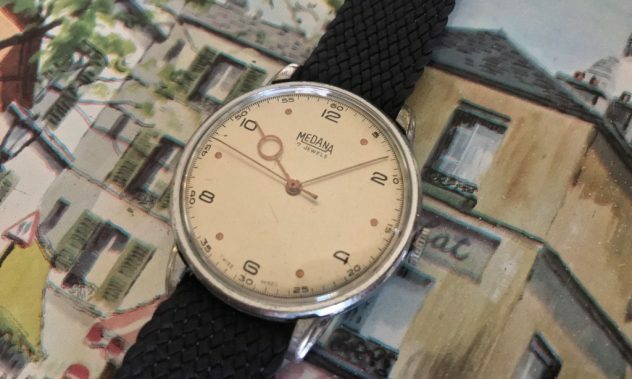 MST had a number of different brands to market their watches under at a time but as your`s is unbranded on the dial it is more likely it was sold through a jewellers/shop. Xould be interesting to see your Watch.